So there I was, sipping champagne on the veranda with Lord Ashcroft and enjoying my early retirement, when the call came through: Cameron’s so desperate that he sacked his old agency and hired M&C Saatchi. Believe me, I was tempted to return to the spoofing game. I even wrote an article. But fortunately, as soon as the latest Tory attack ads appeared, other were quicker off the mark – saving me the trouble. Kudos, in particular, to Jon Bernstein in the New Statesman for highlighting the first spoofs earlier today. Here are four I particularly admired – spread them far and wide. Paul Richard’s LabourList article, Saatchi? What a waste of money!, is also well worth a read. Posted 28 March 2010, 22.22pm. These are amusing, but I do worry that people get caught in the wrong debate - the Tories want a comparison of Brown and Cameron, Labour want a comparison of policies. Though, of course, enough of this, and you follow the Rove tactic of making the greatest asset into the biggest problem. If this happens to Cameron, then I guess that’s a good thing - in so far as Labour aren’t quite as bad as the Tories. There’s a real difference between Labour and the Tories and it’s Policy vs Posters. Labour will win this year. The possibilities are endless with this one. Look forward to the template. These spoofs are brilliant. This is the best way to counteract the millions the Tories are throwing at their Cam pain. At our local hustings last week, the Tory candidate said that Ashcroft’s moneyamounted to one percent of Conservative Party donations. How rich does that make them then? Keep up the good work and make us smile. Labour are the only real alternative in this election. Maybe with the backdrop of the famous Bullingdon photo or a duck pond even. On the launch of the Tory posters, I heard Sky News yesterday reporting that Conservative campaign strategists had said that their greatest asset in the fight to win the general election is the public’s dislike of Gordon Brown. If that’s all they’ve got, they truly are lost. I think you’re right Robin. I will send one to mydavidcameron.com - how about the famous two Ronnies sketch on class with Ronnie C, Ronnie B and John Cleese? No need need for policies David!!! we two Davids were born to rule, went to a public school,we will walk into power. Come on Jack you are a Tory, don’t try to hide behind the Lib/Dems at least have the courage to stand by your party, Oh I forgot you’re a Tory, forget that remark. Lamont was actually the best chancellor of the last 20 years. He presided over one of the best periods of economic growth the country has seen. This website is hilarious, and I commend the sense of humour—but totally blind frothing at the mouth with prejudice. 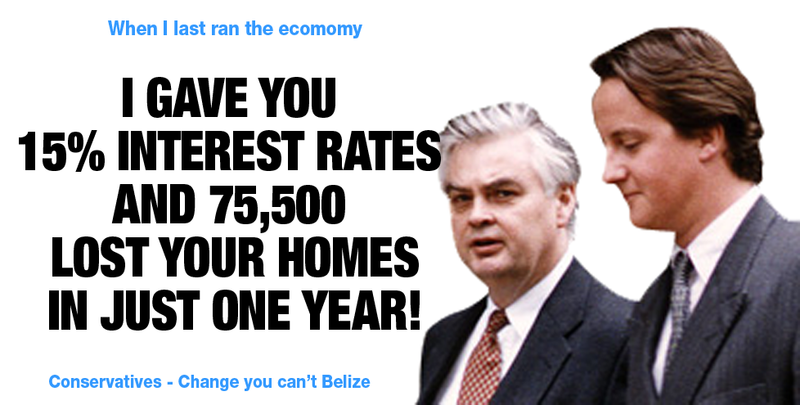 When the tories hit a recession its economic complacency with labour its some kind of world event that we cant affect. You are like some partizan football crowd, its just deeply sad. P.S. If the best comment you lot can make is about Dave being posh then that just smacks of desperation. I went to a public school (not saying which one for privacy) then Brasenose College Oxford a la Dave and I can tell you from my personal experience that does NOT make you out of touch with reality. P.S. how on earth have you made it look like its George Osbourne’s fault that on the increase the national debt—thats just hilarious. True debt has to increase in a recession, but the Labour Government had 10 good years to decrease it, so its unacceptable that it has doubled since 97. HMMMM please try to keep Lamont out of the debate lol, he put all my hard cash to bed the last time a tory had hold of no 11,I just couldn’t believe it when interest rates went up over night to 16% oh and by the way he did’nt happen to go to a bublic school did he? if so ask him if he knew a lad called Osborne,(the one that used to add up on his fingers) every time i think of Osborne running the economy I have to laugh. Do you think we are going to let them get their little dirty paws on our countrys economy? Let democracy through negotiation thrive, not dictatorship through a medieval electoral system! Come on if you want to talk about the countries debt just remember all those things (nationalised) the last Conservative gov’t sold off to keep the economy in tact. How would they have run the country without out that money. It would have meant a bigger national debt or more taxes. I will not go on about interest rates or inflation though, ahh but wait a minute, they are the result of an economical cycle are they not? We are always told we follow the US in terms of economics; what party was in power when we went into recession, um, ah yes the American version of our Conservative party!!!! I would like a hung parliament myself, we as a country need a year or so breathing space until this recession is well and truly over….and then start it all over again! Graham you wouldn’t know if you were out of touch with reality. R REDFERN… Take it that poster hurt! Ouch! Spot on though. By that token, the Tories quadrupled the national debt when last in Government. From £88.6 billion in 1978-79 to £347.2 billion before you can hypocritically cry “money illusion”. Why does Brown always stick his tongue in his cheek when talking to camera? Brown always sticks his tongue in his cheek because…..
LABOUR did reduce the national debt to 29% by 2000, what went wrong? it seems to have gone back up when those two bloody wars started, and we increased NHS spending to just under 9% GDP. I’m all for increase NHS Spending. The last person before Cameron to say he was a “Compassionate Conservative” on his campaign trail was ex US president George W Bush. Get it! !